General Appearance: The ideal Boxer is a medium-sized, square-built dog of good substance with short back, strong limbs, and short, tight-fitting coat. His well-developed muscles are clean, hard, and appear smooth under taut skin. Developed to serve as guard, working, and companion dog, he combines strength and agility with elegance and style. His expression is alert and his temperament steadfast and tractable. Adult males 23 to 25 inches; females 21 1/2 to 23 1/2 inches at the withers. Proper balance and quality in the individual should be of primary importance since there is no size disqualification. Colors: The colors are fawn and brindle. Fawn shades vary from light tan to mahogany. The brindle ranges from sparse but clearly defined black stripes on a fawn back ground to such a heavy concentration of black striping that the essential fawn back ground color barely, although clearly, shows through (which may create the appearance of reverse brindling). White markings, if present, should be of such distribution as to enhance the dog's appearance, but may not exceed one-third of the entire coat. The absence of white markings, the so-called "plain" fawn or brindle, is perfectly acceptable, and should not be penalized in any consideration of color. Character and Temperament: These are of paramount importance in the Boxer. Instinctively a hearing guard dog, his bearing is alert, dignified, and self-assured. In the show ring his behavior should exhibit constrained animation. With family and friends, his temperament is fundamentally playful, yet patient and stoical with children. Deliberate and wary with strangers, he will exhibit curiosity, but, most importantly, fearless courage if threatened. However, he responds promptly to friendly overtures honestly rendered. His intelligence, loyal affection, and tractability to discipline make him a highly desirable companion. American Boxers and European Boxers have differences in appearance, structure, temperament, and drive. The information below will describe these differences. 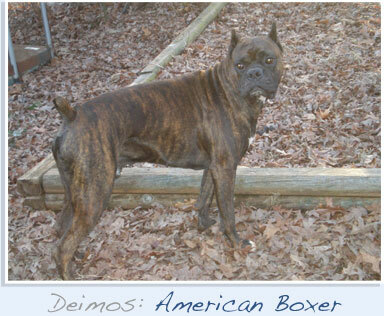 American Boxer: Less dense bone structure, but more elegant; usually has a longer muzzle and very clean neck, often unpigmented third eyelids, lacks deep chest, has a topline that is flat or gently sloping, and the skin/coats are tighter fitting. European Boxer: Heavier and more substantial bone structure; usually has a short nose bridge and high forehead, pigmented third eyelids, deep prominent chest, a topline that slopes excessively, and loose fitting skin/coats. American Boxer: American breeders often focus on cosmetic appearance but sometimes will enter their dog into obedience work. While the American Boxer is just as intelligent as its' European counterpart there is less drive and therefore can be more difficult to train; they are more hyper and have a tendency to lose focus easier. 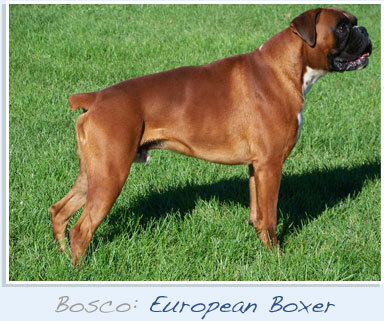 European Boxer: European breeders work their Boxers in Schutzhund, French Ringsport, or other similar forms of obedience, tracking, and/or protection work. Because of this fact, most European Boxers have a fearless demeanor and are easy to direct their extreme drive into a job; they are very focused, serious, and calm.